Vacation rental cottage. Sleeps 6, 2 bedrooms, 2 bathrooms. Cats, Dogs allowed. 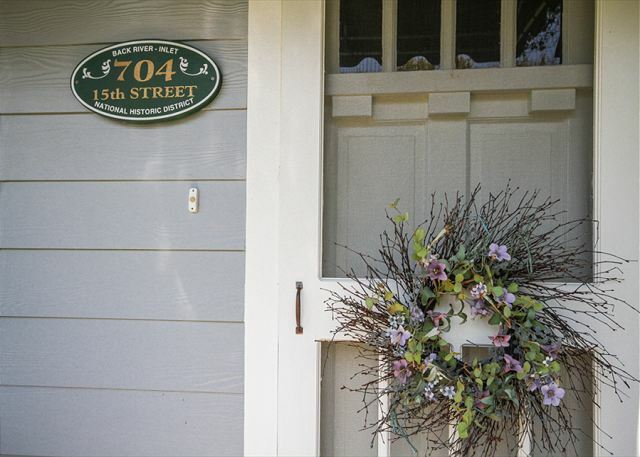 Welcome to Blue Heron Cottage! 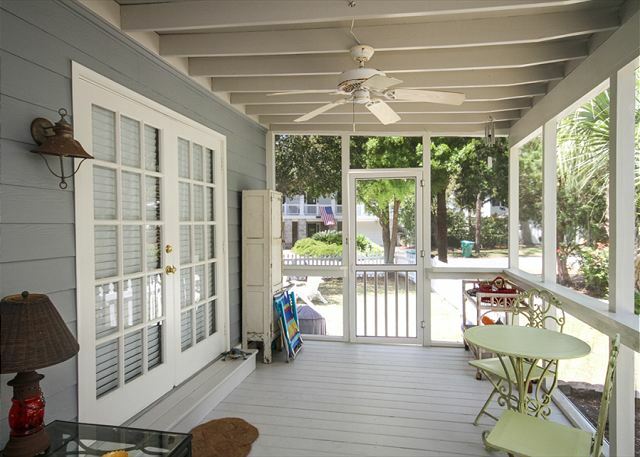 Adorable, historic Tybee cottage; fully fenced in yard and great screened porch! 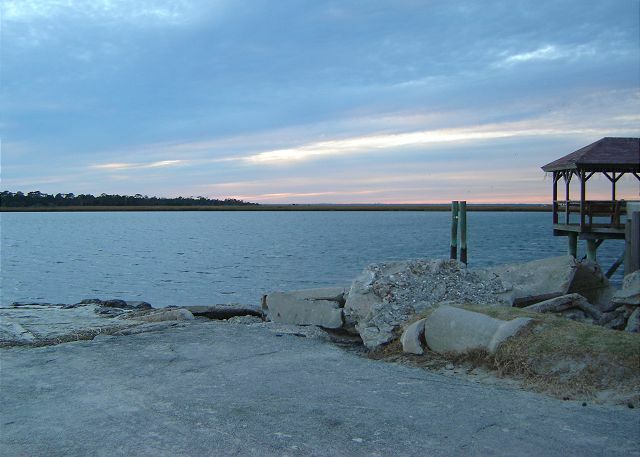 Blue Heron is located in the heart of the historic Back River District of Tybee. The cottage sits on a large corner lot- 15th Street and Chatham Ave. 2 blocks from AJ's restaurant and next door to Dutton Waller Cottage- so ideal for two families! The cottage is only three steps up to make this very easy for people who can't climb a lot of stairs. Side yard with Adirondack chairs and hammock for relaxing! 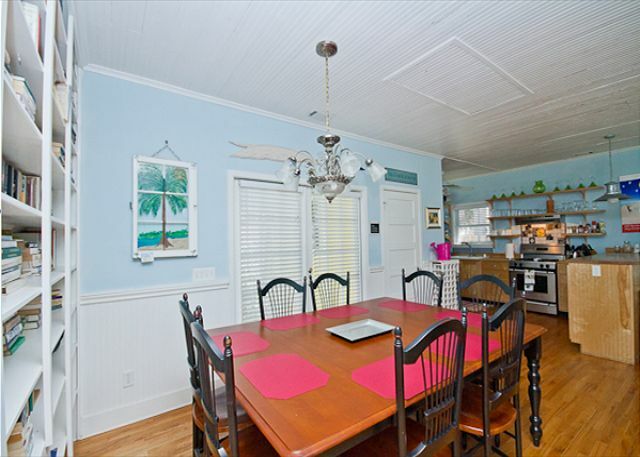 Additional views of the adorable Blue Heron Cottage; white picket fence; great location; great for pets and children! 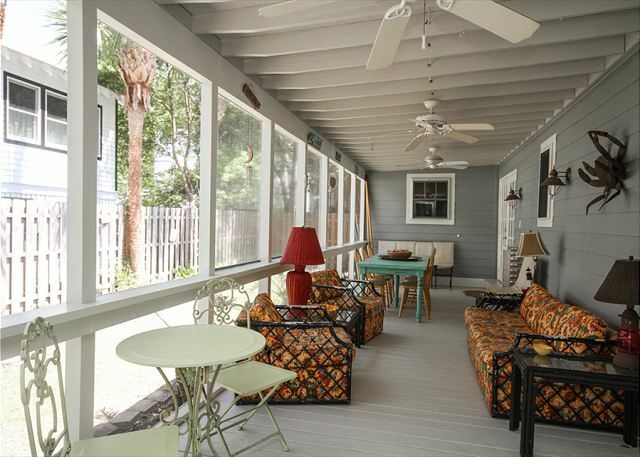 The screened porch has lots of outdoor seating including a table for 4-6. The kitchen is also part of this open floor plan. 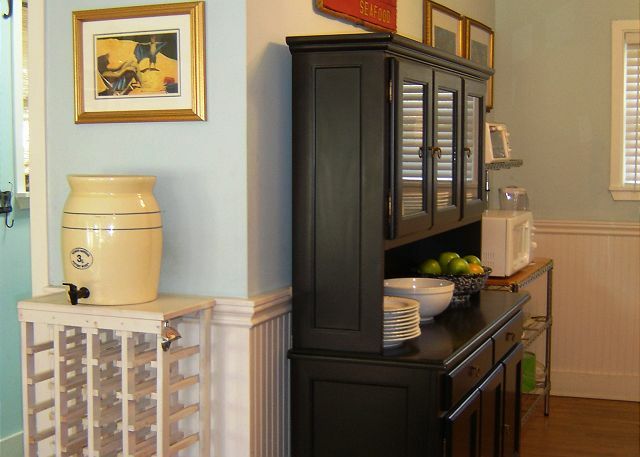 Fully equipped with a kitchen counter and bar stools in addition to the large family style dining room table. 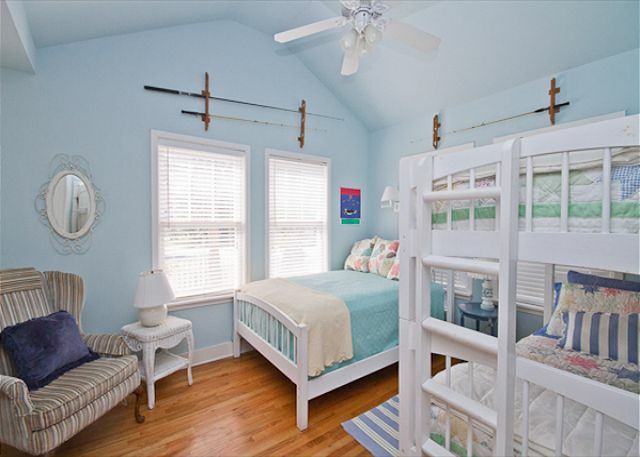 This queen bedroom also includes the master bath as well as a door that leads out to the screened porch. Cable TV as well. 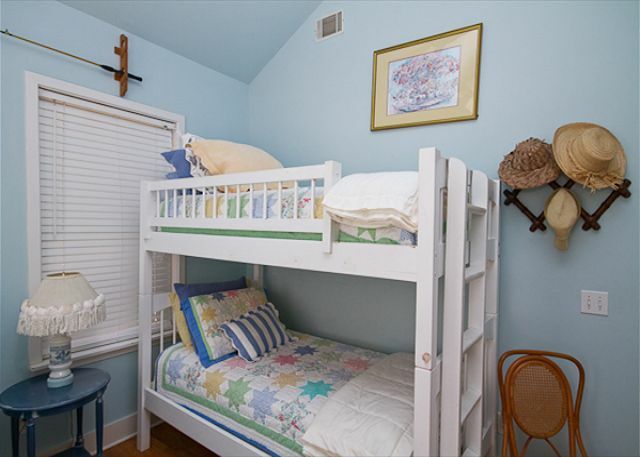 The bedroom includes one double and one set of bunk beds. Sleeps 4 people. 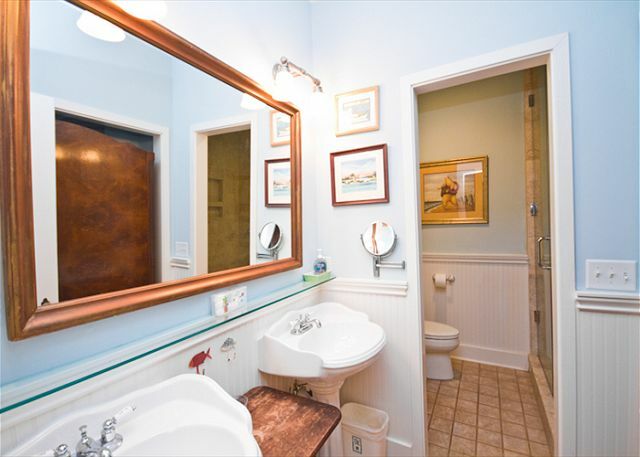 Double sinks in the master bathroom! Alley 3 is 2 blocks from Blue Heron Cottage. This is the main kayak launch area on the island. Also a wonderful place to watch sunsets! Another view of sunset from Alley 3. 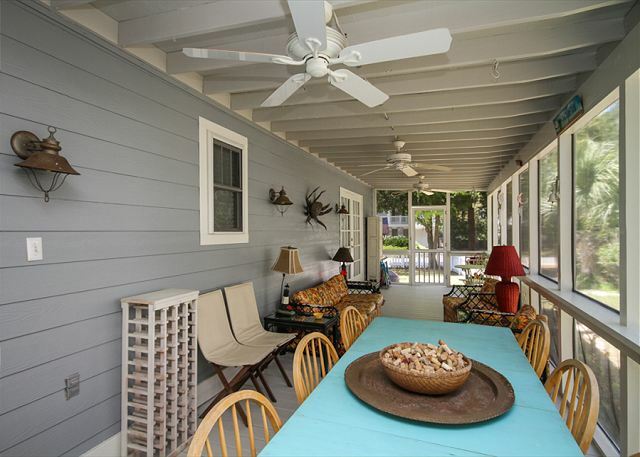 The screened porch has lots of seating as well as a large farm style table and chairs to enjoy meals or playing games. Welcome to Blue Heron Cottage! Super cozy living room will make you want to extend your stay! Come on in, sit down, and make yourself at home! The cottage has a very open layout. 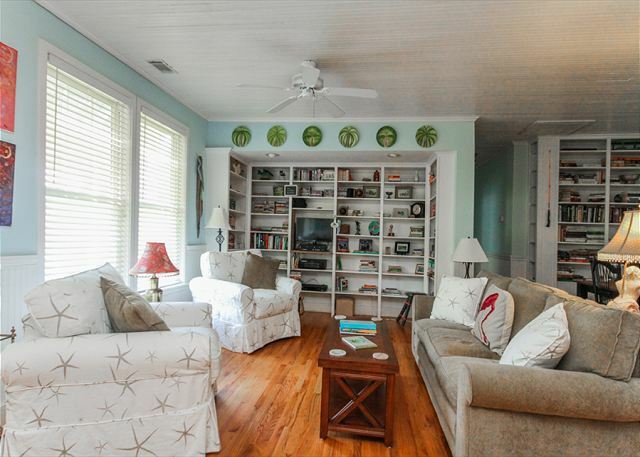 This is the large family room with cable TV and library, dining room and even the kitchen. There is also a wood burning fireplace. Tall ceilings and lots of natural lighting. And they danced by the light of the moooooon! 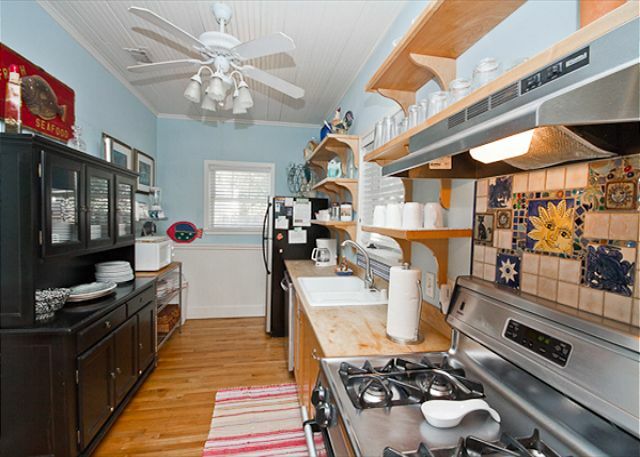 The fully equipped kitchen includes everything you need for your holiday! Another great view of the open kitchen. Even if you're the one cooking you'll still be part of the conversation. That's important on family vacations! 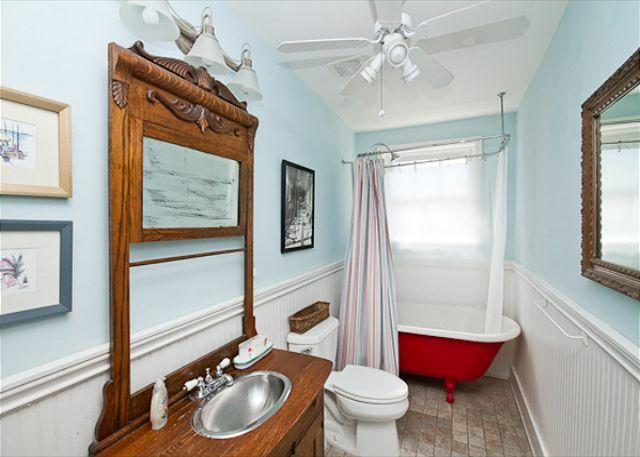 This bathroom features a old fashioned claw footed bathtub/shower combination. 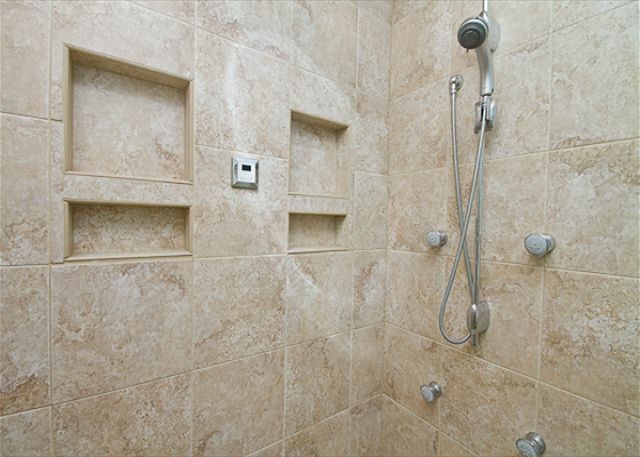 The master bedroom has the master bathroom but all your guests will want to use this shower! Family Books for all, Family Games, Kids Games, Library, Pets Welcome! 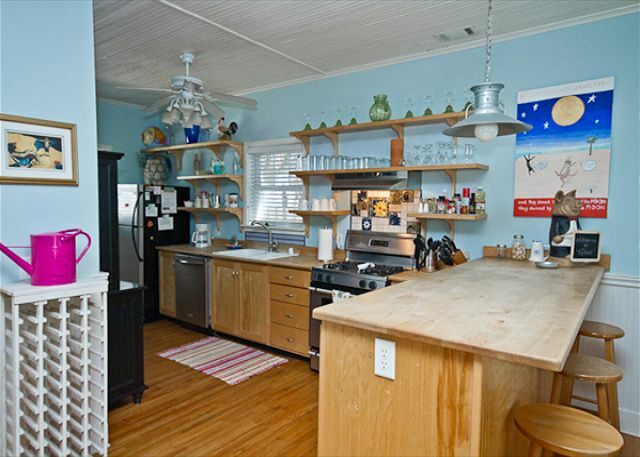 Blue Heron cottage has just the right mix of rustic and modern to make a week at Tybee Island comfortable and “beachy.” It’s wonderful to be near the Alley Street access to the River Inlet, and the walk to the beach is an enjoyable 5 blocks. The Mermaid hospitality staff goes above and beyond to make its guests happy, and they are always friendly, just like everyone at Tybee. The long screened porch with 3 ceiling fans, couch, and table to feed 8 or more, completes the relaxed spirit of the cottage. Life stresses are all forgotten at the Blue Heron. 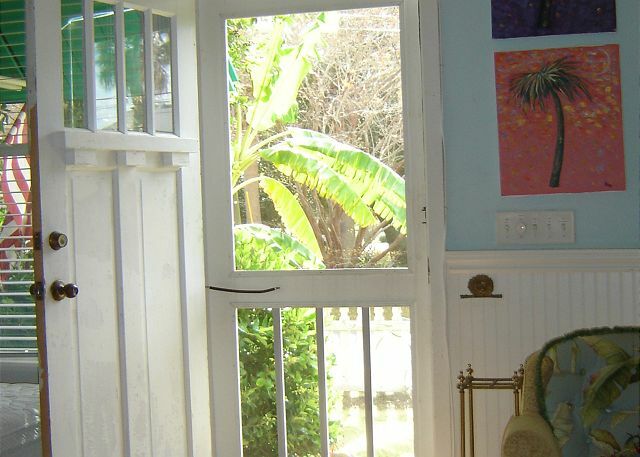 Renting a beach getaway with Mermaid Cottages the best! From the great customer service and response to any issues that may need attention to the overall service from the time of arrival to departure is top-knot! Tech concierge on call and condition of cottages always very good...Mermaid Owner also treats her guests like family! I return to Tybee as frequently as I can as I am a former resident of Savannah. You can’t find quality and service any better than Mermaid Cottages! This is our 2nd rental and 2nd visit to Tybee Island. We have never been disappointed with our trips. We have fallen in love with Blue Heron and the south-western portion of Tybee. I travel with my mother and my 2 younger children. I have to thank Mermaid Cottages for offering accommodations for various situations. I love having a bunk bed and double/queen bed options together in one room. I can't find that in any other company. Thank you and see you next year. My husband and I have been renting beach cottages for many years, and I believe Blue Heron was the “best” ever. 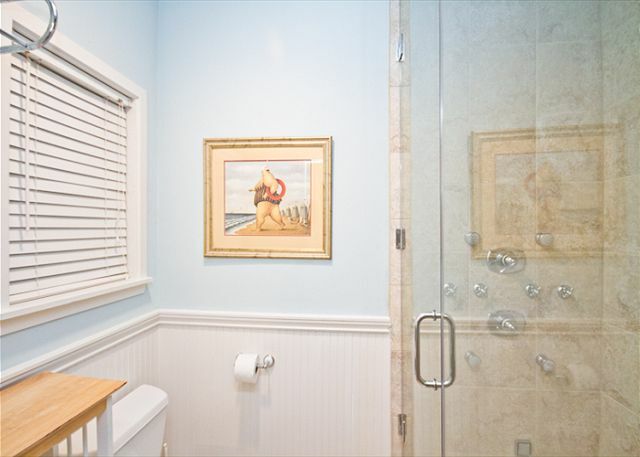 The location is great, the cottage is cozy, spacious, and the shower spectacular. The fenced in yard is a big plus. We brought our little dog JoJo, and she loved laying in the shade watching the cyclist, walkers and golf carts. Hats off to Mermaid Cottages. They did everything to make our visit comfortable and enjoyable. The area was very quiet and the cottage exceeded our expectations. The huge walk in glass shower was a treat. The cottage was comfortable, clean and the huge screened in porch was our favorite room. We spent a lot of time walking around the neighbor looking at fun 'yard art', talking with our dog walking neighbors & getting a massage with Edie. There wasn't much nightlife on a week day...& that was ok with us too. Bring a lot of quarters for meters.......luckily, we remembered to bring a bag full! We always stay with the Mermaids when visiting Tybee, and have yet to be disappointed with any of the cottages. Blue Heron is no exception. Highly recommend! Very comfortable cottage, good location and private. Shower is great! Very cozy home away from home! Ttbee was more perfect than we imagined. 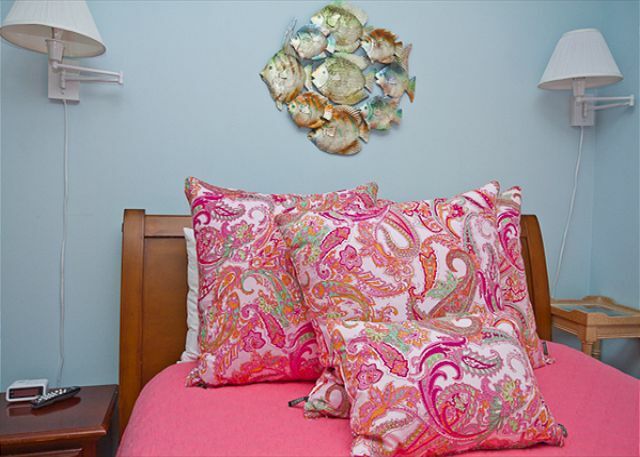 The Mermaid Cottage, Blue Heron, was a very cozy home away from home. We will definitely be staying there again! P.s. The shower is amazing!! Beds were super comfortable. Screened in porch was fantastic and airy! Great location as well! The Blue Heron cottage was everything we had hoped it would be and then some. The online pictures simply do not do this property justice. The Blue Heron is bright, clean, very spacious and beautifully decorated without being stuffy. 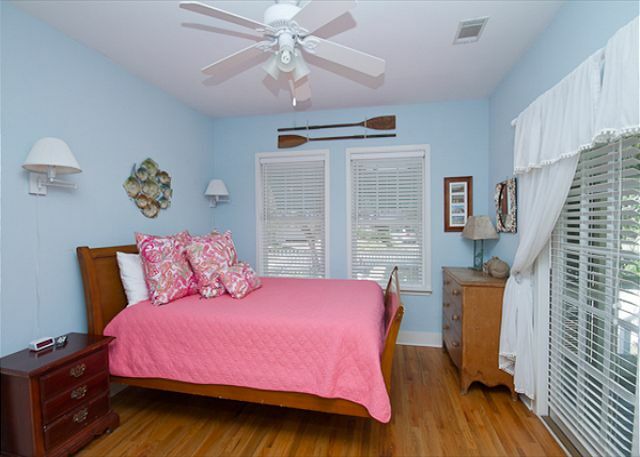 The cottage is conveniently located on a quiet street within walking distance of the beach. We loved this beach house! Super cute on the inside, lots of books plus games and puzzles for the kids. Nice kitchen and screened in porch. Fabulous master bathroom shower! Fairly short walk to the beach. We would highly recommend this house! Staying at The Blue Heron cottage on Tybee Island made our vacation that much more special. It was comfortable, cozy and a great place for our family to congregate for an awesome grilled steak and shrimp feast. After a day at the beach or sight-seeing and shopping, it was great coming back to the comforts of the Blue Heron cottage. Blue Heron was perfect for my daughter and I and her two dogs. We loved the location. We loved the décor. We were very happy with the whole experience. Places to go and very helpful the entire stay. The house was beautiful. It was very nice to stay in a very clean home. The shower is everything that the description says. The house was located in a perfect spot to the backriver. I would absolutely stay at this house again. The blue heron was a wonderful place to stay. We are a family of five and this house was perfect for us. It was clean and decorated so cute. We immediately felt at home. We would definitely stay in a Mermaid Cottage again! It is five blocks from the main road so not a far walk to the beach. Relaxing and so enjoyable. We loved the house and it had everything we needed. I am sure we will be back ! The property was exactly like the pictures on the web site. We enjoyed Tybee Island and Savannah very much. Lots to see and do. We had a great week. This property is about 5 blocks from the main beach. I wanted to make this point as parking at the beach and around Tybee Island is tough so you will need to plan to walk to the beach. This property is only about a block from AJ restaurant so you can easily walk there. Savannah is only about a 20 minute drive from Tybee Island so if the beach is not your thing there are lots of things to do in Savannah. Our stay at the Blue Heron was just a wonderful experience. The Cottage was absolutely adorable. We found it to have everything we needed for our stay. We enjoyed sitting in the living room listening to music. We enjoyed sitting on the enclosed porch, talking and sharing a bottle of wine! The neighborhood was quiet. Our week went by quickly and we just loved the Blue Heron! We stayed a week at The Blue Heron cottage and loved it. The cottage is much larger than the pictures make it seem. It was perfect for two families with dogs and a 19 month old. Warning: the shower in the master bathroom is heavenly. Everyone will be wanting to use that shower! :0) Our shower at home now feels inadequate! Ha ha! The location is convenient and it is so quiet. Everyone at Mermaid Cottages goes above and beyond to make your stay so enjoyable. We have been renting from them for years and will continue. Had a great time! Very clean house, cute decorations, loved all the books!! Very Good. The home was just perfect - it is beautifully and comfortably decorated. The porch is just wonderful! Our stay at the Blue Heron was wonderful. This is our fifth time staying in a Mermaid Cottage on Tybee. The Blue Heron was comfortable and we LOVED the huge screened in porch. We met the owners of the Dutton Waller Cottage next door.The kids and adults had a wonderful week together!The kiddos even had a lemonade stand that week. Wonderful memories were made! Such a fabulous home! I will continue to rent from this company! It was great! The master shower was a complete hit for my entire family! It's close to pretty much everything. All it needs is a sprinkler to play in the yard! This was our fifth time renting with Mermaid and our fifth house. We can never pick a favorite, but this one is right at the top of the list. This property has a great yard, a quiet location (we were a little worried it might not be), a quick trip to the beach, and terrific amenities. It is a gem! We had a good time on Tybee Island in the Blue Heron Cottage. Very attractive, fun décor and plenty of places to sit and relax. We enjoyed bird watching in the front yard. Overall a nice experience. My husband and our 2 young children stayed for a long Mother's Day weekend. We were there 4 nights and enjoyed every minute. The cottage is so welcoming and cute, stocked with all the essentials. We all loved the rainfall shower, the supply of games and my kids loved the bunk beds. It was so great to be in a good, quiet location, we were able to walk to AJ's and public beach access. We didn't run into any problems or have any complaints. It's was a great vacation and I hope we are able to visit again soon! My sister and I came down for 4 nights and stayed at Blue Heron. We fell in love with it at first is so cozy and very nicely decorated. The master shower was awesome and as we are book lovers we spent many an hour going through the book shelves. We ate at Sundae Cafe and it was the best steak I have ever eaten.The property was exactly as advertised and very clean. At the end of our stay at the Blue Heron we decided to stay in Tybee for a few more days, unfortunately Blue Heron was booked. The Mermaids not only found us another property near by but sent someone to help us move our belongings over there.I call that exceptional. Not only would I recommend this property to everyone I know, I have plans to come back in the fall. My wife and I stayed for a week in April. We loved the house we stayed in and enjoyed coming back to it at the end of everyday. The ladies who helped us with our reservation and stay, made sure we were well taken care of. They called several times just to ask if there was anything we needed. We loved it and talked about possibly bringing our family back here one day. My husband and I had a wonderful time during our stay at the Blue Heron. The area has all kinds of fun things to do and see. The neighborhood is quiet and its not far to the beach. The house was clean and comfortable and our pets were safely contained when in the yard. We had no complaints with the house and would stay again or at another Mermaid rental. We loved it in early March! Perfect getaway for a couple with two dogs. It was very comfortable for two but Blue Heron Cottage has a lot of open spaces for socializing,or not. Easy to see how it would work well for entertaining. Inside and out. Quality touches everywhere. It's a happy place in a great location. The Mermaids clearly know how to do things right, couldn't ask for more. We planned this weekend away for some peace and relaxation after a hectic and stressful summer. We were so happy when we arrived at this beautiful, cozy, warm, comfortable cottage. It rained most of our visit, but we had a wonderful time lounging on the comfortable couches and chairs, cooking in the wonderful kitchen and reading on the screened porch. When the rain let up, we walked on the beach and to the local restaurants. Everything is walking distance, but, being on the back river, you feel miles away from everything. Thank you so much for sharing your home with us. We will certainly be back! Specacular! Loved the location and my dog and I loved the yard - big enough for a beagle to explore and wander. We loved walking all over the area and looking out over the water from near the pier and the kayak launch, and lounging on the porch in the afternoons. Wouldn't change a thing - the house is beautiful and comfortable. Tybee is a very cute town, too. Hit some rough surf due to the storm off the coast - fun, but got tossed about even more than I did as a child! Lesson - wear a one-piece suit in rough surf!! My sister and I had a great time at The Bllue Heron. We love the mermaid cottages. Decorated so nicely and equipped with everything we needed. Screen porch a little humid but we loved being able to walk to A.J. 's restaurant . another great stay at another mermaid cottage1 love how your photos are accurate. As always, cottage was **** and span! I love your cottages and I wish there was a mermaid service in every city I visit. adorable, clean and no detail missed! the notebook of info was really helpful with the remotes and new fancy master shower. thank you! This home was wonderful! It was everything we wanted and more. We were very comfortable in this gorgeous home. It is spacious and has everything we needed to make ourselves at home. The whole family was happy. The cottage is nicely furnished and the Mermaids think cover every little detail. I would highly recommend this cottage or any other Mermaid rental. The location is great also. 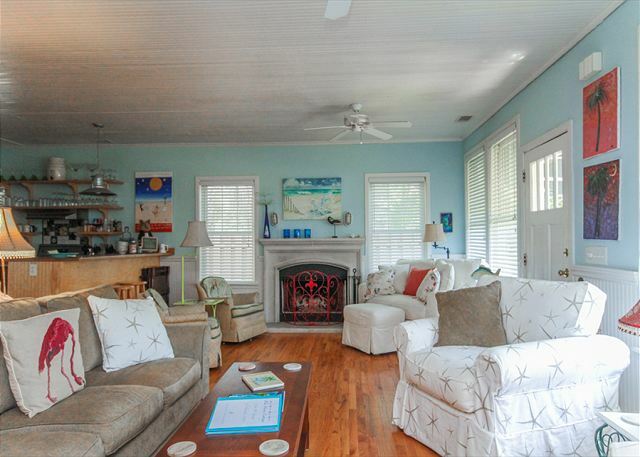 We had a simply fabulous mini-vacation stay at the Blue Heron Cottage in Tybee Island. The house was charming and exceptionally clean. The management company was friendly and very easy to work with. Mermaid Carol was positively the best! Blue Heron is a sweet little cottage and it was a wonderful place to spend our vacation. We found everything to be as it was described and we loved the huge shower in the master bedroom. We ate dinner on our first night at A.J. 's Dockside which was a short walk from Blue Heron. As always, we enjoyed our visit to Tybee Island and Blue Heron. 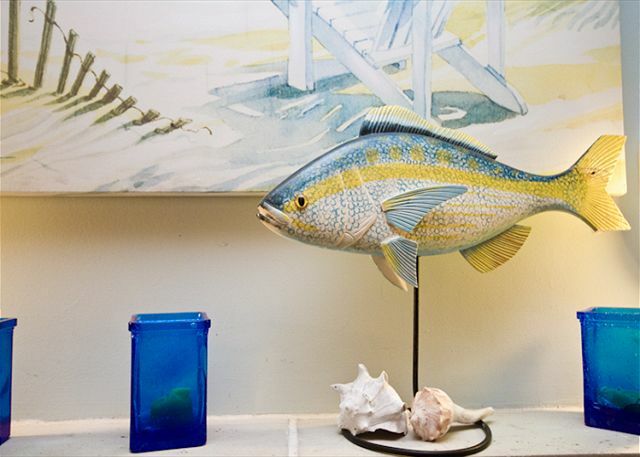 We love staying in Mermaid Cottages and we're looking forward to our next vacation on Tybee Island. 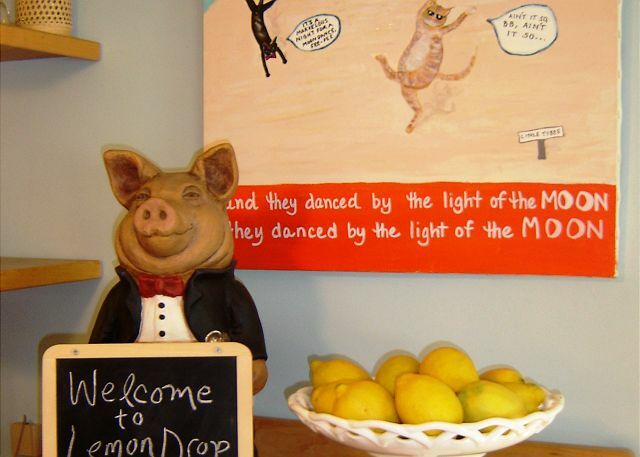 This was our 3rd stay in the Blue Heron (one of the stays, the cottage was still named the Lemon Drop. This home is extremely comfortable and relaxing for our family of four. 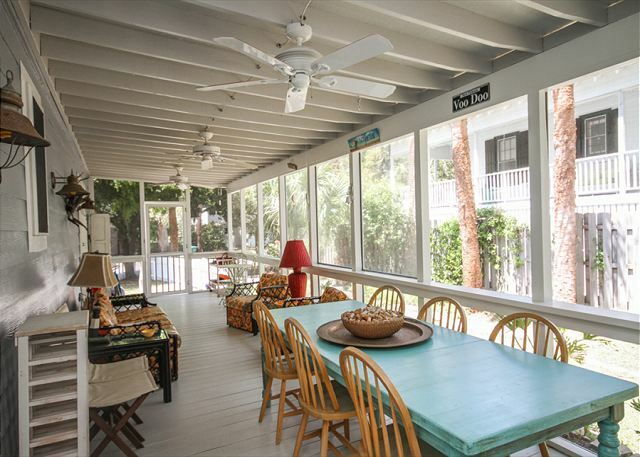 We love the location and the yard and it's so convenient to the beach and restaurants. The large kitchen and great room provide room to spread out. We've stayed with Mermaid Cottages every year for 6 years and we plan to return every summer! I recommend Mermaid to everyone I know..amazing company and staff!! Love our mermaids!! The Best 4th of July Ever!!! Tybee Island during the 4th of July week is amazing. From the Fireworks off the Pier to the Cannon firing demonstration at Ft. Pulaski. Blue Heron Cottage managed by Mermaid Cottages is awesome. Best shower in America guaranteed. We loved the location near the back side of South Beach away from all the night life yet only a 5 minute bike ride to the beach. Being able to walk to AJ's Dockside restaurant to eat and go kayaking was awesome also. Already planning our next vacaation. Beach fun for our daughter & our grandchildren. Relaxing time for the grandparents! Each year our grandchildren request a trip to Tybee; we have not been disappointed. Blue Heron was so magical! My fiance and I stayed here for days leading up to our wedding with our two little dogs. We also stayed here after our wedding until we had to go home. We loved how much space we had within this home, and we loved how historical and the charming beauty this home brought to us. We can't thank Mermaid Cottages enough for allowing us to stay in such a beautiful home for our wedding. Our dog's and family loved this home as much as we did. Carol was a blast to work with, and Brandi our dog sitter was amazing with our little furbabies. I would say that there were many nights spent on the hammock, as well as the back screened in porch. We LOVED IT! We can't wait to come back on our future anniversaries in the next upcoming years! THANK YOU DIANE AND CAROL!!! Blue Heron is so much more than the pictures show. Upon arrival you feel at home, it is warm and welcoming. Very comfy beds, and towels so soft they are like velvet. Perfect lay out for us, and the dog friendly is very important to us traveling with a service dog. Easy walk to the beach-and if you have a dog with you-make sure to visit Alley 3, early in the morning. I will be back-thanks to all the Mermaids and the owners for such a great place to stay. Pam & Leo and Angus. We had a great time with our friends from NC. Claw foot tub was a little tricky getting in and out of but otherwise great times were had. I had such a wonderful experience at the Blue Heron!! I was obsessed with the decor and the amazing shower off the master. It was the perfect little house in the middle of the island but located close enough to the beach and the bar to walk. There wasn't a single thing I would change other than extending my stay for the rest of my life! Even if I tried their is nothing bad to say about Mermaid Cottages. My husband and I were there in September and back for Christmas.The Blue Heron is charming and comfortable. Carol is wonderful to work with on reservations and the gift of candy dropped by was a sweet treat and really personal touch. Thanks to all. Great vacation place, convenient to beaches, sight -seeing, Savannah, dinning and more. It was hard to believe, but when I unlocked the door to the cottage it was even nicer than it looked in the pictures. The beds were comfy, the kitchen was well appointed-thanks for leaving a few spices and cooking oil. I had to take a tub bath and a shower both mornings because they were both lovely. We didn't because one of us was injured, but the cottage is walking distance to restaurants. There was a souffle dish, so of course we had spiche souffle for breakfast. Could use a cookie sheet, but enough other pans to improvise. Absolutely amazing. I plan to come back with my family. The Blue Heron cottage was just charming! The colors, décor, and provisions enhanced the experience. Nothing was lacking. The cottage was clean and well maintained. My husband and I were able to walk or ride our bikes everywhere we went, so the location is great. Thank you, owners, for sharing your place with others. Mermaid Cottages has, hands down, been the best and easiest rental agency we have ever worked with! We have rented many vacation homes in many places, and always have a very intimidating, tedious, list of rules and checkout procedures to follow. We are on edge before even arriving because of possible consequences that might apply if we accidently leave a smudge or God forbid, break something. My husband and I always go in and look for things that might need cleaning or repairing when we first arrive, afraid that they will think we did it. Rental companies certainly need rules, and Mermaid's agreement/contract/rules are written/worded in such a way that is positive; not harsh. Yes, there are requests, but not many. It seems that they truly want you to enjoy your vacation. It makes all the difference in relaxation while you are there. We had just a couple little things that needed repair while we were there, most likely due to the weather, and no questions were asked. The nice maintenance man was there in minutes, and not only took care of our little repair, but checked out other things while there, ensuring we were in good shape. 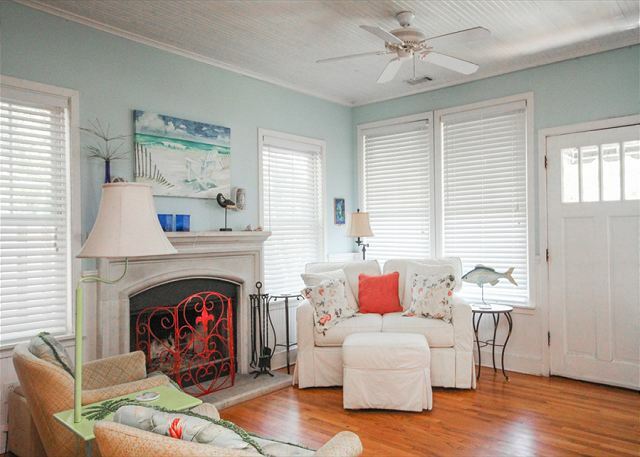 We would definitely rent from Mermaid Cottages again. It was a pleasure dealing with them! Thank you, Mermaids! You should train other agencies! Over the past year we have rediscovered Tybee & have enjoyed visiting. This cottage made this visit so enjoyable & convenient to everything. The Mermaid Staff were very friendly and attentive! The house was perfect and we really were impressed with all of the Mermaid Cottages we saw as we rode bikes through the community. We will definitely stay with the Mermaid folks on our return visit! Thank you! My family has made annual visits to Tybee for the past 5 years - and we'll keep coming back. There's something special and unique about "Tybee Time" that's refreshing for the soul. Diane and the Mermaids are a huge part of the overall experience - a pleasure to work with and nothing is left undone. Blue Heron is in a prime location near the back river with a short walk to your choice of beaches. the home is convenient and comfortable with a fenced in yard that is perfect for pets or children. We're already looking at the calendar for our next visit!! We loved it. Everyone was very comfortable and it felt more like home than any place we've ever stayed. Everything was easy and accessible. We are loyal Mermaid Cottage guests! We have never been disappointed! This was our second visit to the Blue Heron and it is one of our favorites..spacious and comfortable, perfect location! Love it! Thank you so much! I agree Blue Heron is one of my many favorite cottages! But how do we pick favorites - they are like children - love them all for different reasons! Come back again soon! ~ The Mermaids of Tybee Island! This was our 2nd time staying @ Blue Heron & we loved it even more! Diane & the Mermaids went above & beyond to make our vacation perfect. The cottage was in a perfect location. Quiet neighborhood, but not too far from the beach. Can't wait till next summer! Absolutely loved this place. If only it were a little closer to the beach...not a bad walk, but when you are carrying a lot of stuff and it's hot the walk can seem long. Only other issue was the two bedrooms are right next to each other. Every time one of the girls turned over in the bunk bed it would hit the wall. The headboard in the master is right next to the wall where the bunk is. Overall a great experience. I would stay here again and recommend to family & friends. We didn't want to come home!!! My husband and I agreed that this was THE BEST vacation we’ve ever been on. The Blue Heron was very clean and absolutely gorgeous. It’s huge, so we weren’t stepping on each other. Our two kids shared the second bedroom and my husband and I took the master bedroom with the heavenly shower! Once the kids tried the shower, though, it became everyone's shower! :) That's okay. It was worth sharing. The cottage is in the perfect place on the island. I worried about being near the river rather than the ocean, but really, it's close to both and the river was much more peaceful, less crowded, and the sea life seemed to be more abundant. We saw sting rays and dolphins and crabs and some fisherman we walked by kept catching baby sharks! Amazing. Plus, the river is just like the ocean, just not so vast, and the views were spectacular. We walked down to the fisherman's pier (VERY short walk) and then onto the beach for a walk around the southern tip of the island to the main pier on the ocean and back again, every morning and every evening. It was so peaceful and my mind literally emptied of all the worries of the world. The Blue Heron is just down the street from A.J. 's Dockside restaurant which was very good. We also enjoyed North Beach Bar & Grill and Huckapoo's (for pizza). One thing you have to be ready for is that everything is laid back. When they say shorts, a tee, and flip flops are all you need, they are not kidding! Most restaurants either serve you outdoors or in a screened in area. It's all about the outdoors here. After our morning walks on the beach, we drank our Mermaid Coffee in the screened-in porch and it was absolutely perfect. On one rainy day, we played games with the kids on the porch. That porch was where I spent most of my time (when not on the beach!). I loved it and want one of my own! Actually, I want the Blue Heron as my own!!! Wish I could afford it. For now we just plan on going back as often as we can!!! I spent 5 nights here with my daughter and her friend. We all loved it! Plenty of room, comfy chairs for reading, big dining table for art projects. Easy access to beach. We even baked a birthday cake and found everything we needed in the kitchen. The online pictures really did not do this cottage justice. It is bigger and prettier than it looks. And we loved the shower! Thanks! Our stay at the Blue Heron exceeded all expectations. It was the perfect size and location for us. We felt at home. It was made even more enjoyable to be able to bring our 4 legged family members. As always, the Mermaids make vacations on Tybee the best! Great location by back river and AJ's! The Blue Heron Cottage was absolutely the best place to stay. Everything about it was great, the cottage itself, the location to the beach, restaurants and just walking. We were completely satisfied with it and would definitely stay there again and rent from the Mermaids. They are a 5 star operaton!!! 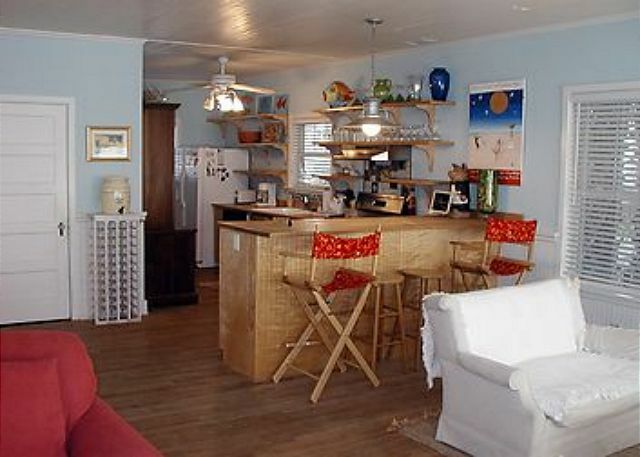 Blue Heron is a spacious beautiful vacation home. 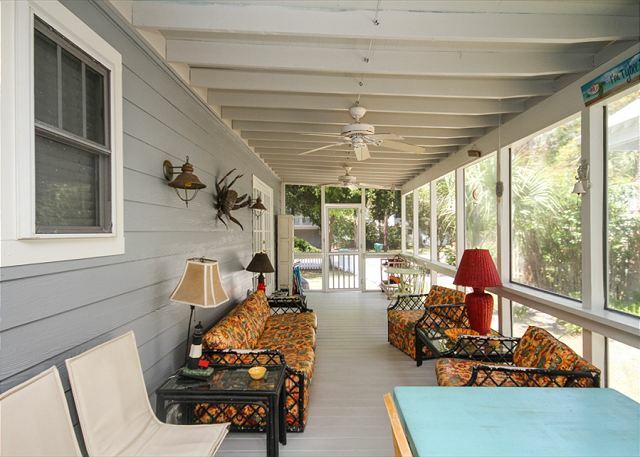 The screened porch is just one of the lovely living areas. The living room/dining/ kitchen is very large and all three areas are well appointed. 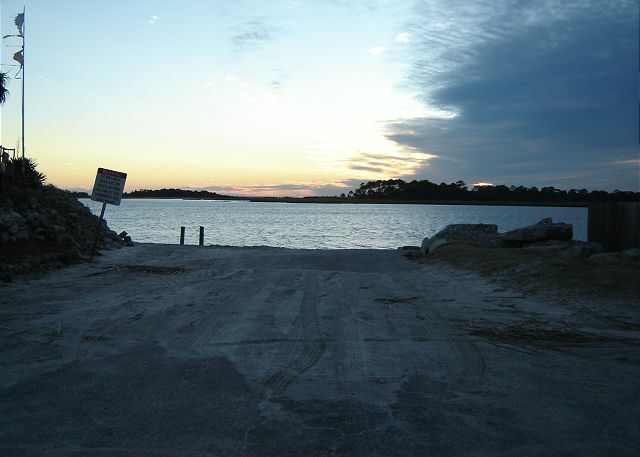 The location is perfect for the beach and the backwater. A perfect Tybee get-away! Relaxed, comfortable, clean, and near many places we wanted to go. Great place for dogs & families. We had a ball. We began to relax almost as soon as we arrived. The "super-shower" and fireplace were just what we needed for the brief pause in our busy lives. Our interacation with Diane and her ingenue, Erin (from mermaid cottages) was so very pleasant. They dropped by to loan us a crate for our dog, and gave us a good amount of information about local eateries, etc. (Thank you so much, Diane!) We took them up on their recommendations and were not disappointed. Diane came back by to drop off some left-over passes to a local attraction and she is just so helpful and kind. We thoroughly enjoyed our stay on Tybee, and the Blue Heron home. It felt like it was ours during our stay. My husband said several times that he wants to buy it and live there! Guess he had a good time! Tripadvisor ratings aside, we had a great time at Sting Rays (conch fritters to die for/great musical entertainment), Breakfast Club (fast-paced diner/brasserie atmoshphere, great staff) and Fannies (you MUST get the Jalapeno Bottle Caps - hand battered and amazing) Oh and also sweet potato fries and crab stew at Social Club. Yum to all! I tried to make that crab stew and couldn't do it as well - that's the best recommendation I can give! 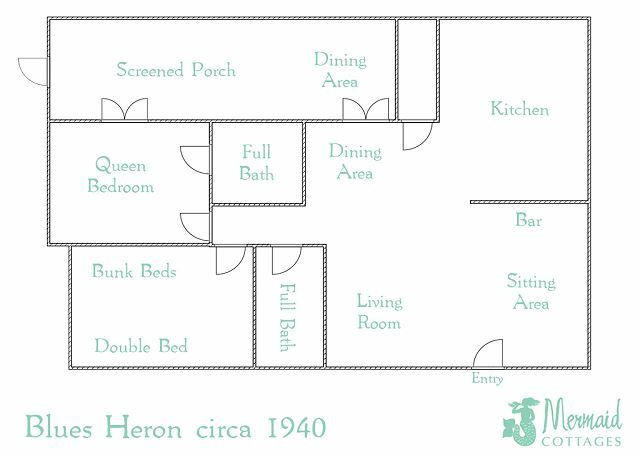 The Blue Heron Cottage was the perfect setting for a reunion of four grade-school girlfriends! We woke up each morning of our stay to a refreshing cup of "Mermaid Bliss" coffee. We parked our cars on arrival and didn't get back in them until we left to go home. This cottage is in sucha convenient location. We walked everywhere. AJ's Dockside Restaurant was so close as well as the "downtown area" and the Breakfast Club. The walk to the beach was very quick. I will be going back to this great Historic Cottage...hopefully very soon. Our visit to Tybee this time was two fold -- first to celebrate our anniversary and relax and to attend Jane Coslick's Cottage Tour which was just awesome. We got to see the results of Jane's renovation of 17 cottages -- all of which were outstanding. Our stay at Blue Heron (this was our first time there) was wonderful -- Blue Heron is a great place to stay with all the amenities you could want -- and the new shower -- well, you could spend the day in it!!! The staff, as usual, at Mermaid Cottages is simply superb -- accomodating and responsive in every respect. Overall another great visit to Tybee and thank you to the owners of Blue Heron and of course to Diane and the Mermaid staff. As always, Mermaid came through with a great stay. The cottage is our favorite so far - bright and sunny, comfortable, homey. Thank you again! As you know, we will be back. Overall a very nice stay. Furniture not very comfortable. Televsion way to small and needs to be updated to modern technology. Had a wonderful time....wish I was there! We got there and found our cottage completely clean and stocked with what we needed for our first night. Everyone including our dogs loved the cottage and yard. The little guest dog tags were the MOST thoughtful! Mermaid Morning Bliss coffee on the screened porch the first mornings was perfect. The master bedroom bed and shower were the icing on the cake. The complete quiet in that neighborhood was just what we needed. The staff was amazing, professional and gracious. True southern hospitality. Go there if you NEED a total break from your real life! We were so glad to discover Tybee Island and what better time than Pirate's festival weekend. Thanks to the wonderful staff at Mermaid Cottages we were alerted to the festival when we booked our rental. My wife and I invited our daughters' and grandsons to join us for the Pirate Fest and we were happy that they could take time to share our first trip to the island. The Blue Heron cottage was everything and then some that we expected it to be. It's location was excellent for walking to Town or beach and also very close to the marshes. We enjoyed the cottage,plenty of space,nicely decorated and clean. I would really like to thank Diane of Mermaid Cottages. She was very helpful in recommending a boat tour (which in itself was worth visiting Tybee) and just her down to earth friendly personality making it great to work with Mermaids for our first visit to the island. We hold very special memories of our vacation and can't wait to visit Tybee Island again with the help of Mermaid Cottages! The cottage was fantastic! Large, open and airy; beautifully decorated; spotless. It had everything we needed. This is the first time we did not stay right on the beach, and we loved it! It's in a very quiet neighborhood. The screened-in porch was a great plus; our kitties loved watching all the birds and butterflies and didn't want to go inside! Will definitely stay here again! Thanks to Diane and all the Mermaids; you are all the best! The "boys" and I had a great time, as usual. It is clear that the Mermaids care about their renters, the property, and qualityin general. We have no reason to rent from anyone else!! Thanks. One of the best little vacations. Everything about the cottage was great! It was clean, comfy and had everything we needed (Our dogs loved the complimentary dog biscuits)! Close walk to the beach and little shops. This was our first trip to Tybee and we loved it! Can't wait to come back for another stay with the Mermaids! I stayed in August 2012 for several days. Everyone mentions the main bedroom shower and I will too - it is fantastic. The house is gorgeous and roomy, beautifully decorated but also comfy, with a large kitchen. The beach is about 10 minutes away on foot and the location is fantastic. Mermaid was great to deal with as usual! Best Vacation We've Had in Years! Thank you for providing such a lovely property for us to relax in while on vacation! The Blue Heron was a lovely home! We were able to walk to the beach and several restaurants. We brought our dog because even though Tybee does not allow pups on the beach we prefer to have them with us. They very much enjoyed the fenced yard and long walks around the island. The kitchen at the house was lovely, and we were able to cook wonderful meals. Best part of the house was the shower in the master bathroom - that was amazing after a day on the beach! We will definitely be back to Tybee and renting from Mermaid is the only way to do it! An outstanding experience all the way around - thank you all! My family of four just left blue heron and we're already planning another stay. The pictures online were great, but the house was better than expected, much more spacious and such a wonderful location! This was our first time on tybee but we hit the jackpot with our first visit. The home is just a short bike ride from the south beach and a mere 3 block walk from a fishing pier where fish abound- we caught a shark! Also you're just down the road from AJ's where you can rent and launch a kayak. The mermaid staff were attentive and checked in to be sure we had everything we needed. The only thing I hope to see updated when we return is the porch couch/chairs. Super fun and funky, but they're a relic for sure, you kind of stick to the vinyl :) this house and the mermaids are true gems, best place on tybee for sure!!!!! The house was nice, floors were not that clean....had to wear socks to keep our feet clean from dirt and pet hair. However I am aware this house is pet friendly so in the future I will choose a house that is not pet friendly which will take care of that problem. I would recommend this house to my friends who have indoor pets.Other than the floors the rest was super clean! We enjoyed the shower and the nice screened in porch. The tv or cable I'm not sure which kept cutting out but only in the living room.The master bed was super compfortable! Over all I enjoyed our stay with mermaid but next time I will try to get a different house. This was our first yr staying with mermaid cottages, in the two previous years we stayed on the "marsh" or creekside I guess you call it, which was more private (with a different company) hopefully we can find something about the same with mermaid next yr.
We really enjoyed staying at the Blue Heron! From the location to the decor, everything was perfect! Bill, from guest services, was a real pleasure to work with! We would recommend this cottage and Mermaid Cottages in general to anyone who wants to get away for some R&R! This was our third stay with Mermaid Cottages and our second in Blue Heron. Being a born and raised Georgian, Tybee Island/Savannah has long been my happy vacation place. Since moving north several years ago I haven't had as many chance to visit so we decided to spend a week this summer. As expected, the cottage was in great condition-super clean inside and out. The location is perfect for us. Close enough to the beach to walk there but far enough back on the island that it is peaceful and quiet. 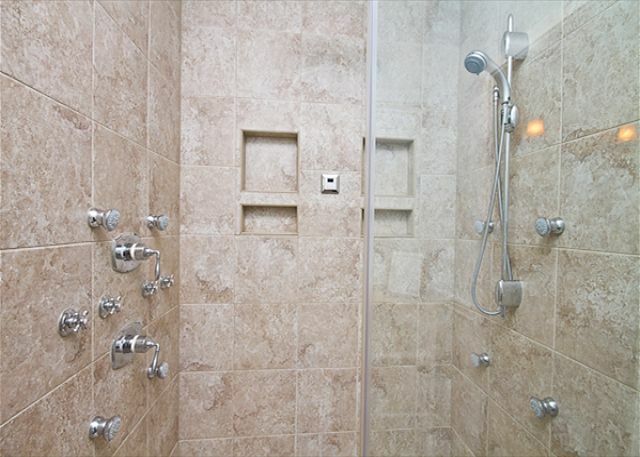 The biggest change since our last visit was the new shower in the master bath-amazing and a great addition! The Mermaid staff has always been friendly and helpful and I love how they support local artists and organizations. 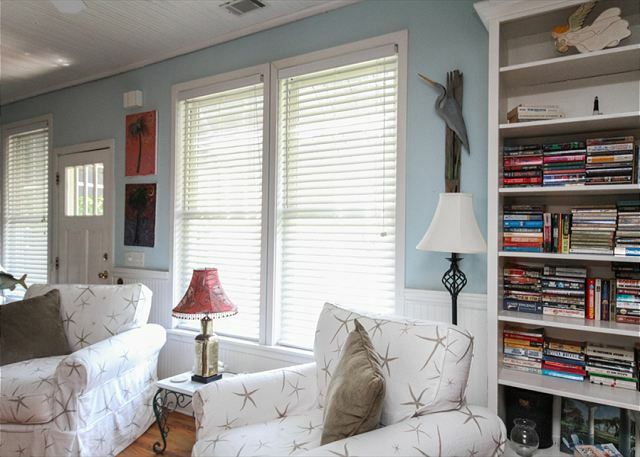 I would, without a doubt, recommend Mermaid Cottages and the Blue Heron to anyone looking for a spacious, quiet retreat on Tybee. 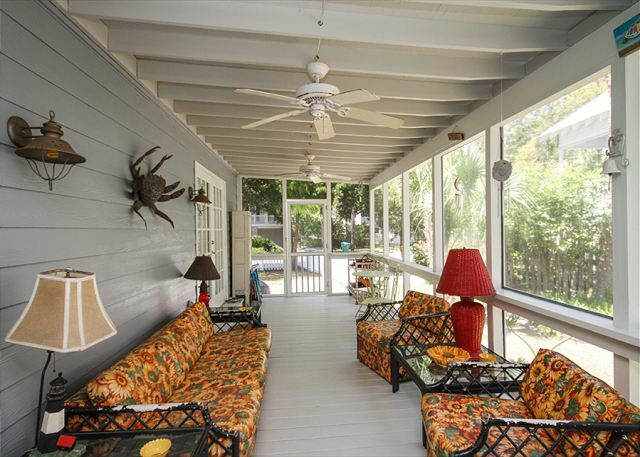 This is a wonderful updated vacation home that is close to the beach, town, and the backwater. However, it is very private and is in a nice neighborhood. My husband, nine month old baby girl and I had a wonderful time on Tybee Island. The Blue Heron was perfect for us and very comfortable. We would love to visit again, but next time we might bring along our extended family so we would have to choose a larger cottage! The Blue Heron is great!! This was our first visit to Tybee. We loved everything about it! We will back again for sure. Thank you Mermaid Cottages! From the moment we arrived, we knew we made a great choice in using Mermaid Cottages! Blue Heron was positively perfect for our family of four. 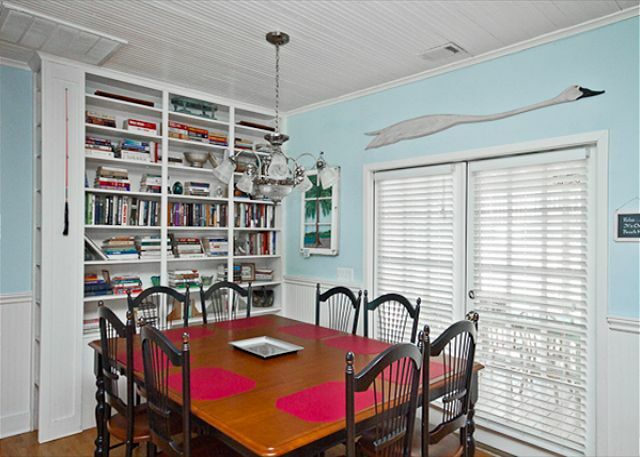 Low key, but clean and quirky in lovely seaside cottage decor. Loved the extra touches of DVD's, books, etc. The place was spotless + welcoming. Thanks for an absolutely perfect vacation. We'll definitely be back!!! The cottage was charming and everything I hoped it would be. The island was beautifull and the people welcoming and very friendly. Thanks for sharing, we will be back.